Tekst Unique. Dwarven Ring. 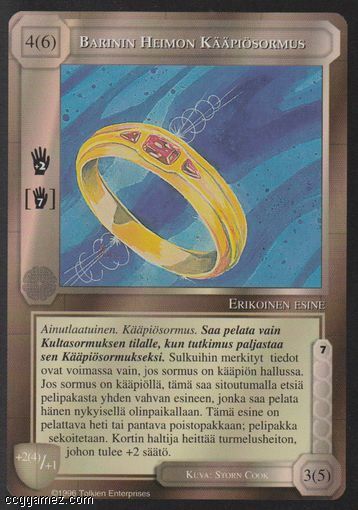 Playable only with a Gold Ring and after a test indicates a Dwarven Ring. Values in parentheses and brackets apply to a Dwarf bearer. Tap a Dwarf bearer to search your play deck for a major item playable at the bearer's site. Play this item immediately or discard; reshuffle the play deck. Bearer makes a corruption check modified by +2.